Verve worked on redefining the online image of The Style Coaching Institute by giving the company a digital transformation to help support and grow the already glowing success of the business. 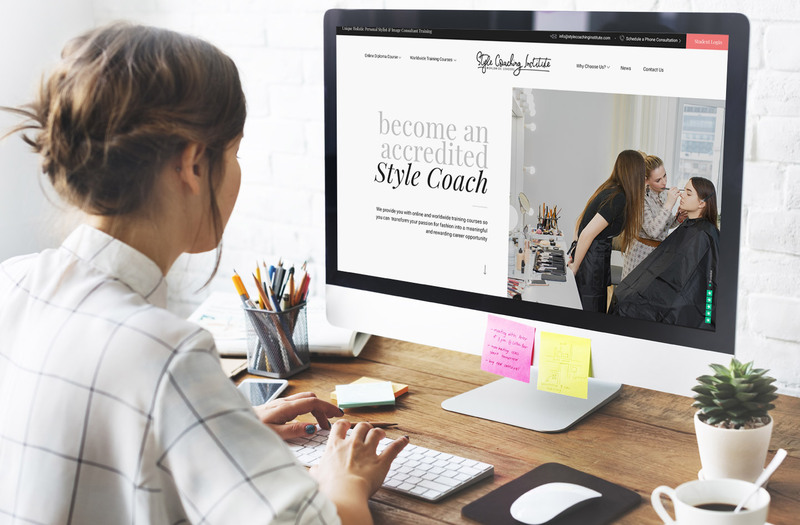 The Style Coaching Institute® provide online training courses and live events that teach individuals how to become professional Style Coaches™. The Institute provides an online diploma course which is available worldwide and currently has students in 82 countries. 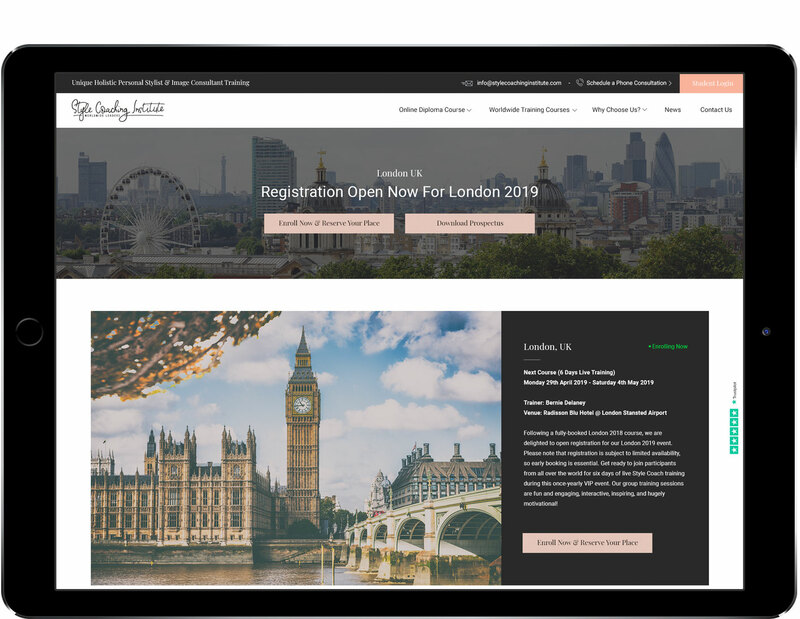 The company wanted to rework the website to the highest standard possible to fit in with the sleek and professional image of the business itself. Verve were enlisted to provide new websites that would help the company achieve its objectives. This included establishing a visual identity and brand throughout the websites, providing a positive user experience and being SEO friendly with a manageable CMS system. The website needed to streamline the process of enrolling and managing the students with smart backend integration using moodle. It needed to be fully responsive on all devices, have great social media integration, ability to incorporate video, a blog section and finally be adept at taking payments and have the facility for individual membership functionality. Trustpilot was used to collect and manage user reviews which in turn created a positive reputation for the website. 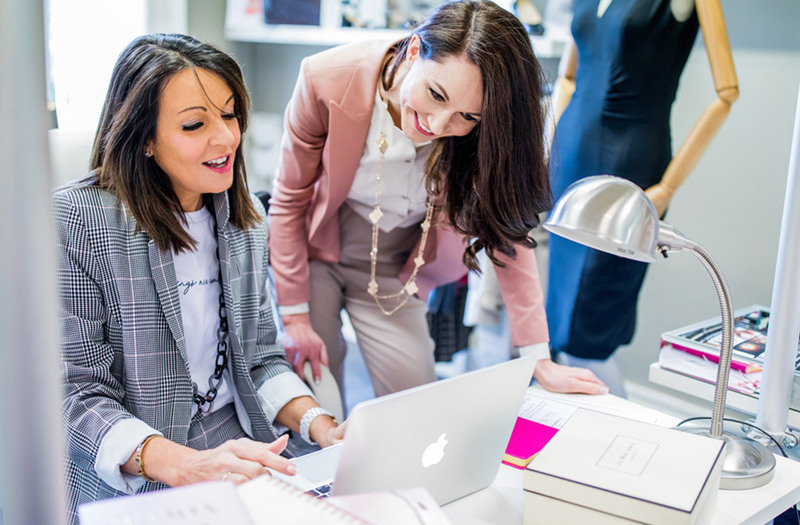 In the run up to the launch of the new website we worked with The Style Coaching Institute to create a full-service marketing strategy to ensure that impressive results are effectively delivered. Working with Verve has been an overwhelmingly positive experience. We did a lot of research before choosing them, as it was a big decision for us and represented a significant change in our whole business model. Aside from the obvious web development and design skills offered by the team, what I really valued was their honest and constructive input. It was so helpful to see our online business with their fresh eyes – when you’re so busy working on the day-to-day running of your business it can be hard to see what your customers see, and you can't improve what you're not aware of. As a customer, I was expecting a huge amount from Verve, and it was a leap of faith for us to entrust them with this project. But – I am delighted to say that they delivered on everything they promised and there were no nasty surprises along the way. I found the whole team very honest, transparent and hard-working. We worked closely with Sarai, who was truly wonderful – not only is she an incredibly talented professional, but she is also easy to work with and it was a pleasure to collaborate with her. I couldn’t fault the way that the team handled any stage of the process. Their responses were quick, they went out of their way to minimise stress for us, and their service went above and beyond what I would have expected. I would recommend them in a heartbeat to any business owner looking to take their company to the next level. I am profoundly appreciative that we chose Verve and am looking forward to a long-term collaboration with the team. Thank you!